Magee Ronald Cameron ( Ronnie ) April 11, 2019 Peacefully at Altnagelvin Hospital ( in the tender loving care of his family in his 83rd year ) much loved husband of Jean, devoted daddy of Desmond, Raymond, Kenneth, Jennifer and Wendy, loving father-in-law of Deborah, Pamela, Lynn, Cecil and Stuart, adored granda and great-granda. Service of Thanksgiving in his late home 51, Foreglen Road, Killaloo on Saturday 13th April at 1.30pm followed by burial in Upper Cumber Cemetery. 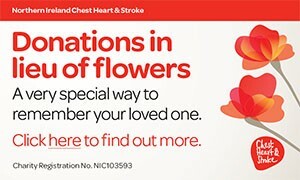 Family flowers only, donations in lieu if desired to Killaloo Parish Church c/o Mr Richard Kincaid, 17, Sutton Gardens, Kilfennan, Londonderry ( family time please from 11.00pm until 11.00am ). All enquires to D & R Hay & Sons, Funeral Directors 02871 312567. Dearly loved and will be sadly missed by his entire family circle. One of Life’s true gentlemen. I am sorry to tell you that Ronald Cameron ( Ronnie ) MAGEE has passed away.